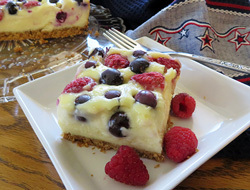 Delicious cheesecake bars with extra added flavor from fresh raspberries and blueberries. A great way to use your seasonal fresh fruit. This red, white and blue colored bar is also perfect to serve at your 4th of July or Memorial Day celebrations. Preheat the oven to 350° F. Line an 8 x 8 baking dish with foil. 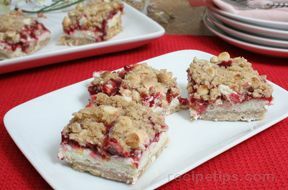 Combine the graham cracker crumbs with the melted butter; pour into the foil lined baking dish. Spread out evenly and press down firmly. Combine the cream cheese and sugar in a mixing bowl; beat until smooth. Beat in eggs one at a time. In a small bowl whisk the cornstarch into the milk until blended. Add the milk-cornstarch mixture and lemon juice to the cream cheese mixture; beat just until well blended. Do not over beat. Pour over the graham cracker crust and spread out evenly. Sprinkle the raspberries and blueberries over the top. 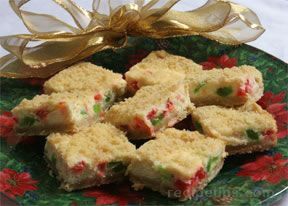 Place in the preheated oven and bake for 40-45 minutes or until almost set. Cool. Refrigerate 4 hrs. or overnight. Lift out of pan. Cut into bars. Refrigerate extras. "Yummy cheesecake! I wanted to try these to see how they turned out before making them for the 4th of July. I made them Wednesday and they are already gone so everyone must have liked them. They will be great for the 4th. Just a note, I did have to bake them for about 50 minutes to get center to firm up."